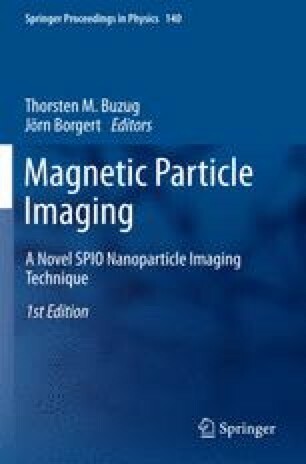 Due to its ability for quantitative 3D real time imaging with high sensitivity and spatial resolution but without ionizing radiation and iodine-based contrast agents, Magnetic Particle Imaging shows great promise for the application to the image guidance of cardiovascular interventions. For this purpose, the blood in the vessels and the instruments would have to be visualized, e.g. using a SPIO-based contrast agent and a SPIO labeling, respectively (SPIO: superparamagnetic iron oxide). In a simulation study of this situation, simple models of a guide wire and a catheter with a coated tip as well as a filled balloon catheter have been examined under a variety of conditions. The appearance of the instruments in the reconstructed images has been shown to be strongly dependent on the imaging parameters (gradient strength), the difference of the SPIO concentrations in adjacent structures as well as the geometric extensions of the instrument and its position inside the vessel (partial volume effect). It has been demonstrated that the visualization of instruments in a vessel may be possible with positive or negative contrast, depending on the individual circumstances.